Died 23 September 1987 in Middleburg, Virginia, aged 63 years. Benjamin C. Evans, Jr. was born 14 March l924 in Crawfordsville. Indiana. He graduated from Crawfordsville High School. While in high school, Ben attended the Culver Military Academy Summer Camp and was a member of the famed Black Horse Troop. His final summer, he was selected as troop commander. Following graduation from high school. Ben attended Wabash College for a year. 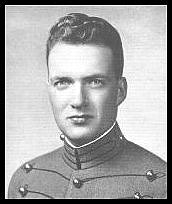 His summers at Culver undoubtedly influenced Ben's decision to go to West Point, and so he joined the Class of 1946 on the banks of the Hudson on 1 July 1943. His roommates recall Ben as a model cadet, receiving few demerits. Academically, he was brilliant in the non-math areas, but something of a "goat" in math. He was a leading member of the riding team and an outstanding jumper. He had a beautiful tenor voice and was a most important member of both the Glee Club and the Cadet Chapel Choir. His classmates in the 1st Regiment well remember the serenades by Ben, Tom Campbell and Henry Bolz around the Clock Tower on those warm spring and summer evenings. As a cadet, Ben demonstrated the characteristics that were to distinguish him throughout his career. He was easy going and calm and unflappable under stress. He was such a nice guy that sometimes his roommates picked on him, as roommates will. On one occasion, Ben was out of the room just a few minutes before an expected room inspection. So, his two roommates braced themselves against the door to hold Ben in the hallway, expecting Ben to panic when he couldn't budge the door. Across the hall lived Hank Foldberg, All American end on the Army team. Ben enlisted his aid. His roommate can to this day hear Hank say. "Mr. Evans, please stand out of the way!" With a rush, Hank took out the top of the door; and Ben calmly entered the room leaving his roommate, who was room orderly, to explain to the Tac how the door got smashed. Going into the Infantry after graduation, Ben went to Japan after the Basic Course at Fort Benning, Georgia. After a year as company commander and battalion level staff he was selected as aide de camp to Brigadier General Eugene L. Harrison (USMA '23), the Chief of Staff, I Corps. It was during this assignment that he met Jan King, the general's step- daughter. He and Jan were married in 1952. Ben always said that he married into the Army. Jan had attended kindergarten and the first three grades at West Point. Her father was USMA '28 and she had a brother and two uncles who were graduates. From Japan, Ben went to Washington, DC, where he was aide de camp to the commanding general, Military District of Washington and White House military aide. He again traveled to Japan where he became chief, Plans and Policy, Psychological Warfare, for Eighth Army (Japan). This was followed by an assignment as Chief, Political Intelligence, Eighth Army (Korea). At that time, there was an offer broadcast to North Korea of $250.000 for any pilot who would fly a MIG into UN hands. This was Ben's brainchild. He was thoroughly intrigued by intelligence work and decided that it was the field he wanted to pursue. He was selected to attend Columbia University where he received his master's in public administration with a concentration in foreign affairs. In 1956, Ben came out on the "outstanding list" for early promotion to major. By his time however, he had made up his mind that he wanted to spend all his time in intelligence work, an option not available to him on active duty. So in 1957, Ben resigned his commission to join the Central Intelligence Agency. He hoped that through this avenue he could prevent wars so others would not have to fight them. Ben's first five years with the Agency were spent in staff and line positions including two years in Cuba where he helped close the embassy. His specialties were political and paramilitary operations. This was followed by an assignment as deputy director and then director of an annual multi-million dollar program with resident managers and programs in several foreign countries. In 1981, Ben retired from the Agency having completed twelve consecutive years as executive secretary to the director and deputy director, Central Intelligence Agency, as well as executive secretary, Central Intelligence Agency. The length of time Ben spent in this key position is remarkable. He provided expert continuity as Schlesinger replaced Helms as director, then as Colby replaced Schlesinger, Bush-Colby and Turner-Bush. He was there for the first three months of Casey's tenure. Richard Helms said of Ben, "He always had his eye on the ball." To say that Ben's position was critical is an understatement. In addition to acting as chief of staff for the director and deputy director, Ben carried the chief administrative responsibility for CIA's interaction with the White House, Cabinet and other departments and agencies. His position called for skill, experience, judgment, diplomacy, firmness and discretion. These were all characteristics that Ben had in abundance. He garnered immense respect from his superiors, peers and subordinates. The chances for errors with grievous consequences were very real, but Ben never faltered. His calmness under pressure was never more of an asset than in his position at the Agency. That he served six successive directors and deputies under four administrations is ample testimony to his effectiveness. When Ben retired in May 1981, the Director of Central Intelligence presented him with the CIA's highest award for service, the Distinguished Intelligence Medal. Ben was the quintessential family man. The three most important women in his life were his beloved wife, Jan and their two daughters, Karla and Louise. All their vacations were family vacations with the two girls. At the CIA, his secretary was always instructed that if either of his two daughters called he was to be interrupted. Ben was happiest to he on his farm in Middleburg, Virginia, with his wife and daughters. He was content to be alone with his "three gals." Ben's enjoyment of the country and nature at his farm represented the culmination of a lifelong dream. When he applied to Wabash College in 1942, before entering West Point, he wrote, "The fact that I was surely born with an ardent love for the out-of-doors and for animals has been a means for personal satisfaction. This increasing love of the out-of-doors is responsible for a great part of the happiness in my life. I regularly feel the need of it. I find it both stimulating and soothing." That he was able to be in the country with his loving family after his retirement was greatly satisfying to Ben. Those who knew Ben appreciated his terrific sense of humor. In December 1986, one month before his illness, Ben was dressed in "black tie" en route to Washington to meet Jan to go to the Symphony Ball. Knowing he wouldn't get dinner until very late, he stopped at a McDonald's fast food outlet on the way. Another patron, an attractive woman, was overwhelmed by this handsome gentleman all dressed up at McDonald's and came over to tell him how elegant he looked, With a twinkle in his eye, Ben replied in a friendly but serious manner "I always dress for dinner." Each person who contributed input to this aside had one common phrase with which they described Ben Evans. "He was a true gentle man." After that universal description, his friends and family remembered Ben in many ways. He was completely honest in all his dealings. He was modest and unassuming, never envying anyone. Ben was quietly and pleasantly his own man. He had no big ego; he was always a real team player. When needed, he could be firm and a great leader. No one disliked him. He was a great conciliator. He was everything that can be described in a genuinely good human being. As Benjamin C. Evans, Jr. joins "The Long Gray Line" his family and classmates can remember that he was a wonderful, concerned and caring husband, father and friend. We will miss him very much.